Click on Rights in the main navigation menu to manage the rights for all available contracts. In addition to contracts that have been created manually, assets that have been uploaded to Revelator will have automatically generated contracts based on information previously entered. Contracts created in Revelator may be deactivated, edited or activated at any time. Hover your cursor over any contract to access an actions menu. 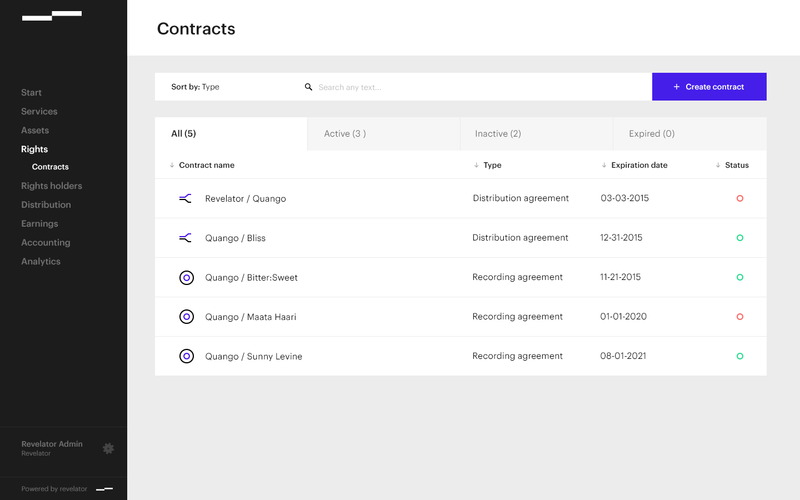 Click on the Actions menu to View, Edit, Activate, or Clone the selected contract. Click View to see an overview of all contract terms. Clicking Edit allows all terms of the contract to be edited. Click Activate to apply all contract terms to all relevant assets, income and parties it applies to in Revelator. Click Clone to create a duplicate of the selected contract and edit any terms. This is commonly used to extend rights to a new time period, region or release format.